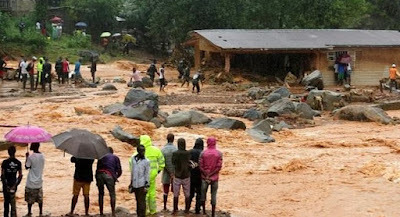 Sierra Leone buried at least 300 victims of devastating floods on Thursday, as fears grew of more mudslides and accusations of government "inaction" over deforestation and poor urban planning mounted. With the aim of clearing the overflowing central morgue, burials began around 1800 GMT in Waterloo, a nearby town where many victims of the Ebola crisis that hit the nation in 2014 were also laid to rest, according to a morgue official and an AFP journalist at the scene. President Ernest Bai Koroma was accompanied by Liberian President Ellen Johnson Sirleaf, whose nation also lost thousands to Ebola, both wearing surgical masks as the decomposing bodies were put into the ground. More than 100 of the dead are children. "We will not bury our hopes," Koroma told mourners. "Sierra Leone will rise again."